Cyrell Paule made headlines when she violently attacked Martha Kalifatidis on Tuesday night’s explosive episode of Married At First Sight. But fans were also sent into overdrive after they discovered a major editing fail during the fight scene. As spotted by MAFS Funny, Cyrell was seen going to confront Martha wearing heels, before being filmed speaking to her in a pair of black boots. During the fight, Cyrell violently attacked Martha while she was relaxing in a robe with a face mask on. Producers were forced to step in and drag Cyrell away from Martha, but found themselves in the firing line as she then threw a large ceramic fruit bowl at them. A furious Cyrell then packed her bags and fled the show while telling her ‘husband’ Nic Jovanovic to ‘get the f*** away from me’. The fight occurred after Cyrell found out Martha had asked Nic about a rumour that he’d touched Jessika Power’s leg at the last dinner party. ‘Go get that b**** now, I’m sick of this s***,’ demanded Cyrell to Nic, before they then went directly to Martha’s room together. Speaking to Martha about the rumour, Cyrell raged: ‘I’m just going to be straight up and frank with you, I genuinely don’t like you. As things became heated, Martha responded, ‘B****, if you f***ing swear at me,’ prompting Cyrell to violently grab her. With Martha then safely stood to one side, Cyrell was ordered to leave her room, before noticing the makeup artist was sneering. ‘Are you f***ing laughing at me?’ screamed Cyrell while charging back at her. 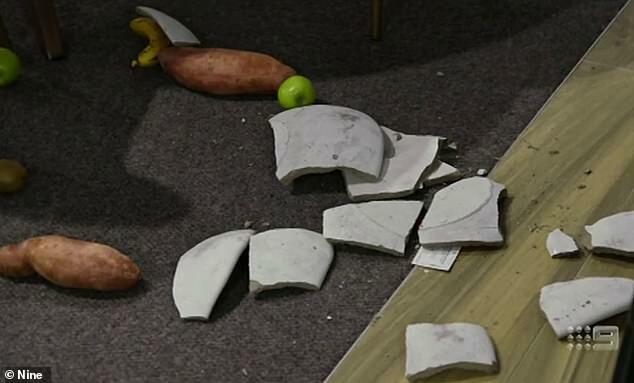 Cyrell then threw the large ceramic fruit bowl in the direction of Martha and the producers, with it smashing into pieces on the floor. Despite then packing her bags and leaving the Meriton Suites North Sydney, where filming occurs, Cyrell returned hours later and was given her own room. The following day, expert John Aitken demanded she apologised to Martha. ‘I am apologising for my aggression and breaking your bowl, I am not apologising for what I said,’ said Cyrell before storming out of Martha’s room. Proving their feud isn’t slowing down, Martha then compared Cyrell to a dog.